On my mind these days: mothering. I was given links to two videos, and I share them here because I can’t stop thinking about them. The mothering going on in these videos is epic, inspiring, and at the same time so simple, so unadorned and humble. A webcam streaming from Savannah, Georgia. 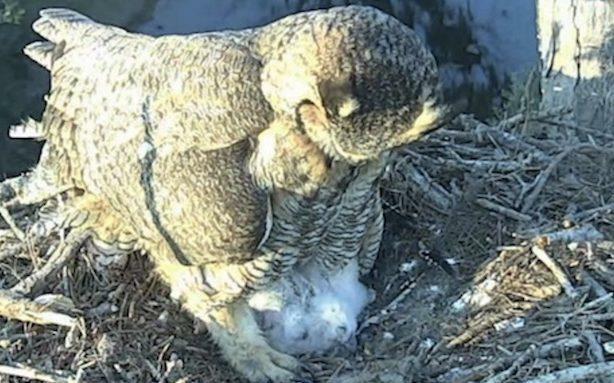 It’s a great horned owl in her nest, tending to her week-old owlets. Here’s a highlight. The dad brings a rat every now and again, while she sits for hour upon hour on her babies, providing a down blanket for them, basically. One eye open, snoozing, then alert and dangling rat savories for the babies. A four-minute documentary about two women who decided to teach inmates how to knit at a prison in Maryland. When my friend Betsy told me about this program, I instantly assumed that the inmates were women. I was wrong. This is Lynn Zwerling. She spent five years—five years—persuading prison officials that a knitting program for inmates was a good idea. What nurturing and care, what patience and persistence, and maybe a little stubbornness. She was in car sales before she retired and began this program, Knitting Behind Bars. Worlds apart. The owls, high in a tree near a swamp, are as free as the wind. The inmates knit in a windowless room, under the most constrained circumstances imaginable. Yarn, needles, and scissors are counted at the end of a session. Nobody knits except in that room, with these women present. But instinct is at play in both the great horned owl and the retired car saleswoman. The owl knows what to do. 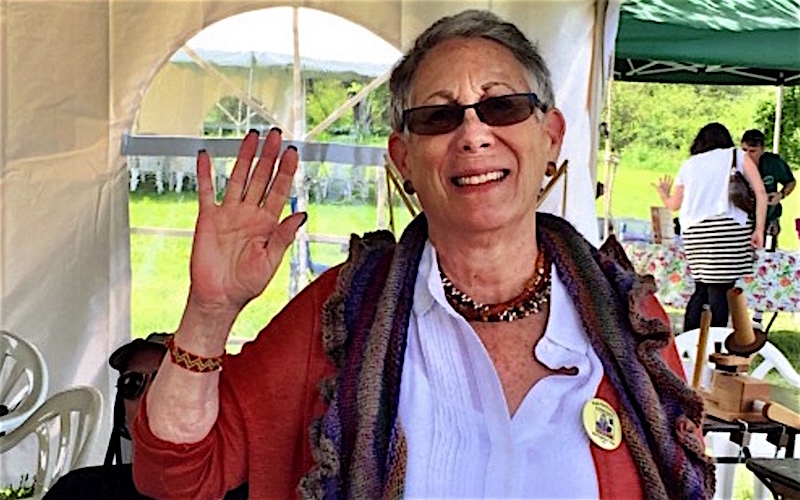 Lynn Zwerling does too, knows deep in her heart that this project was worth fighting for. In a Washington Post article, Lynn said, “We come from a generation that believes the individual has the potential to impact society.” She acted on that instinct, and now, more than 400 inmates are knitting. These videos are about the same thing. There’s slowness in each, a patience and a recognition that life is exactly this. You work with what you have. You have constraints. But you keep at it. Knitting Behind Bars works under severe prison constraints on materials, but they can accept donations of certain specific yarns and needles. The Knitting Behind Bars website has details here. And you can make a financial donation via that website as well. Well. I’m a jaded former child support officer, aware of knitting programs in prison such as this one, and this two minute video made me cry. Knitters are so generous. Would love yarn donations but..it must be new with ballband intact, must be worsted weight, wool is okay, but acrylic is best. Alot of restrictions but it is prision after all. What we actually prefer is monetary donations so we can buy what we need when we need it. Storage is a huge problem as we have to schlep all supplies in and out each week. So, thanks for asking . You could send yarn if it meets the qualifications or you could paypal us a small donation at [email protected]. email me for address for sending yarn. So grateful for your offer. Thanks! Based on comments looks like I’m not the only one who missed this the first time.